10:28 with a low at 10:00, we probably have a 6 hour up fractal; We have a square today. 1/18/2008 11:51:51 AM Mountain TG:: Happy Birthday Dr. Al. Enjoy the rest of your day! 1/18/2008 10:25:23 AM Mountain TG:: Blood on the Street, gotta love it. Was a little bummed yesterday that there was such a huge decline, had too pretty good entries but got whipped out for soso gains of 4 and 6 points. I don't like jumping back in and trying to chase after a move that not close to the 110 even in this environment where its been running a long way from the 110. Today, -3 on buy attempt, + 20 on reverse from one position to the next. I have 6 day fractal ending in time precisely at today's low but last Friday I'd have sworn we'd get a mid day low based on a multiday fractal, too and the lows kept coming into the close. 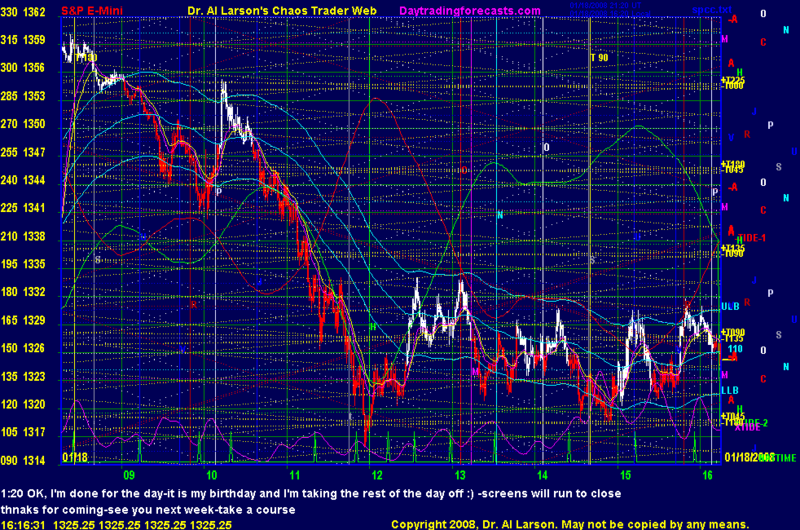 But that multiday fractal had a half day in it and a holiday so that proabably skewed it.